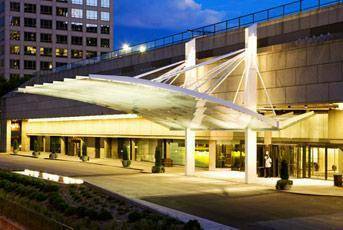 Ideally located in the heart of downtown, The Westin Kansas City At Crown Center welcomes guests with renovated hotel rooms and suites, superb service and a pet-friendly policy. Recharge in our oversized accommodations, which feature our Heavenly Bed, floor-to-ceiling windows, large work desks, flat-panel TVs and mini-refrigerators. Club-level rooms and suites grant access to the amenities of the Club Lounge, including free breakfasts. Take advantage of the outdoor pool, the WestinWORKOUT Fitness Studio and our complimentary local area shuttle. Delicious American and Italian cuisine, as well as tempting libations, can be found at our hotel restaurants and bars. Plan a lavish wedding or executive board meeting within our 53,000 square feet of sophisticated event space. We are also directly linked to the Crown Center Exhibit Hall. Hotel guests are an easy distance to Union Station, Sprint Center and the Kansas City Convention Center, as well as nightlife in the Power & Light District. One East Urban Bar + Kitchen: One East Urban Bar + Kitchen features the finest locally crafted beers and spirits, paired with Modern American fare in a vibrant, communal atmosphere.